Is a new kitchen on your to-do list this year? If so, you’re probably asking yourself many questions. What appliances and features do you need to cook the way you want? What finishes will give your kitchen the appearance and feel you are seeking? What sort of design will allow you to move freely between tasks, cooking and entertaining? Chances are, you’re looking to strike a balance between function and style. Kitchens tend to be the hub of the household, where people tend to gather to eat and socialize. Due to the costs and amount of work involved, remodeling isn’t an every-year project. It’s important to think hard about your habits, needs and lifestyle, as well as how well the kitchen will look in the years ahead. What’s cooking? Multi-function and healthy options: Remodelers want options when it comes to cooking. “More than one oven is practically de rigeur in the higher-end home,” Ahearn says. “You must have two ovens, if only for two holidays a year.” Dual wall ovens are popular. “Multi-purpose appliances are in demand,” Sollecito says. “For example, a double oven that also has steam or microwave cooking.” Homeowners are also looking for ranges that offer built-in sous vide capability. For some of Ahearn’s clients, it is a must-have. “The introduction of sous vide or steam into ovens is a signal that healthy methods of cooking have become a strong trend,” Serra says. For cooktops, most are going larger, and induction cooking remains popular. “People are definitely asking about induction,” Ahearn says. The homeowner’s choice in major cooking appliances depends on their cooking habits, Serra says. “Those who do light cooking want value and reliability first and foremost. Those who cook regularly may be more concerned with pure function or both aesthetics and function. 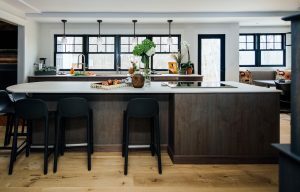 Stainless still leads, but black stainless shows life: “Stainless steel, like white kitchen cabinetry, has been a key player in kitchen design since the late eighties,” Serra says. 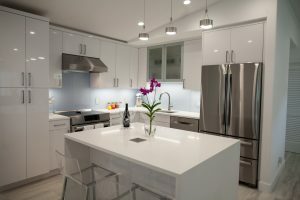 “That’s staying power, compared to many trends in kitchen design that have come and gone.” But traditional stainless isn’t the only finish catching the eye of remodelers. Ahearn says black stainless is popular with younger clients, and Serra reports that dark gray, black and charcoal stainless finishes have come on strong in the last few years. AHAM research shows that 67% of three-door bottom mount refrigerators shipped in 2018 were traditional stainless, and 19% had black stainless finishes. For side-by-side refrigerator models, 57% were traditional stainless and 7% were black stainless. Among dishwashers shipped last year, 51% were stainless and 9% black stainless. Beverage stations: Various types of beverages are getting the royal treatment during kitchen remodels. “People are incorporating coffee stations, and they are very serious about it,” Ahearn says. How they go about it depends on their budget. Higher-end designs might be plumbed or built-in with restaurant-grade espresso machines. The trend goes beyond coffee. “Smoothie stations are the new thing in beverage centers,” Sollecito says. “They incorporate under-counter refrigeration, prep sinks and perhaps a lift-up door to conceal the juicer.” And don’t forget wine. “Wine storage is huge,” Ahearn says. “In the high-end kitchens, they want to show off their wine collections. The beverage trend isn’t limited to high-end remodels. Ahearn reports dedicated beverage refrigerators being incorporated into mid-priced remodels as well. 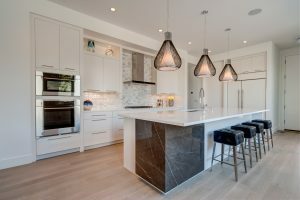 Connected features are slowly showing up: The designers we spoke with reported mixed levels of interest in connected kitchens. Ahearn sees some interest among her younger clients. “They want to be able to control their appliances from their smart phone,” Ahearn says. “Their refrigerator tells them what to buy. They want to be able to turn on the oven and set it to a certain temperature and time, or tell when the oven is on and they’re not home so they can turn it off.” Sollecito sees the most interest among Millennial homeowners, particularly in voice control and touch-free options. Portable storage: You’ll want to incorporate into your new kitchen easy access to the portable appliances you use regularly, and the popularity of portable appliances like Instant Pot, Vitamix and air fryers makes portable-friendly design elements a must. “A shallow pantry that sits on the countertop may be ‘home’ to several small appliances,” Serra says. “A separate tall cabinet just for small appliances and equipment in lower drawers can be a featured furniture design.” Sollecito always designates a cabinet for small appliances, or storage near the kitchen. “The mixer lift accessory is great for those heavy portable appliances,” Sollecito says.